The complete classical guitar wood kit includes all the wood necessary to construct either the guitar in the book or the DVD box set using my methods. The kits includes everything from the back, sides and top to the side and lining laminations, the fret wire, saddle, nut and tie block inlays. 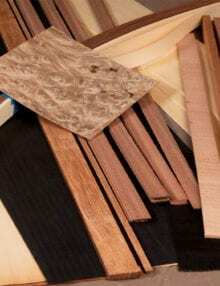 When buying guitar wood doesn’t make more sense to get it from someone that actually makes guitars? I only buy wood from reputable, knowledgable people that I can trust to pick out exactly what I want. Nothing is more irritating than receiving a shipment of wood that you find unsatisfactory. That is why J.S. Bogdanovich Guitars has partnered with Allied Lutherie to supply the complete kits. Allied is a top notch wood supplier for luthiers and I have been purchasing wood from Todd at Allied for many years. Part of the kit will ship directly from Allied in California. The J.S. Bogdanovich Guitars portion of the classical guitar wood kit is what is included in the classical guitar wood details kit. The spruce top kit will contain Alaskan yellow cedar side laminations and the cedar will contain pear wood side laminations. Limited servicing of your kit is possible. You can opt to have your fingerboard slotted and sides pre-thicknessed to .070″. Be sure to specify in the comment section is your would like the compensated slotting or the standard. Last year, I purchased the spruce top kit from JSB; this was my first build. For me, purchasing the wood/materials in “kitted” form was key. The kit price is very reasonable (for a single build); I know/I looked. More importantly, all the materials in the kit are of high quality selected by those in the business. I had no difficulties during the build with any of the operations (milling, planing, bending, assembly, etc…) due to the wood. I’ve since had a few players/builders comment how nice the materials were in appearance and sound/tone. The rosette burl was nicely figured and added to the aesthetic element. Overall, this kit was a great way to go – quality product. I recently purchased/received a cedar top kit from JSB. The materials received are of the same quality.